Spiced Pecan Dust for sale. Buy online at Zingerman's Mail Order. Gourmet Gifts. Food Gifts. A culinary secret from our own kitchen. We’ve been making spiced pecans for decades. They’re a Zingerman’s holiday classic and outstanding year ‘round. 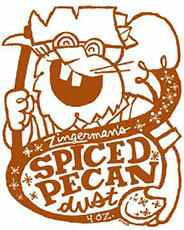 We’re in full “spiced pecan mode” here at Zingerman’s Mail Order. We make them in our kitchen a couple times a week and they ship out (nearly) as fast as we can tin them up. We start with whole pecans that we toast with butter, sugar, lots of freshly ground Telicherry black pepper, ground ginger, Jamaican allspice, cloves, ginger, cardamom and sea salt. As they toast, all those spices and butter meld with the pecans, bunching together in clumps of caramely sweet, nutty, slightly spicy deliciousness. We don’t fill a tin with anything but those tasty clusters, but the "dust" that remains is just as delicious and really versatile. One of my favorite ways to use it is in baking. If you make cinnamon rolls at home, use this dust for the filling instead of the boring old mix of cinnamon and sugar. It’s great in cookies and banana bread as well. Wanna do something savory? Use it in stuffing or try the dust over sweet potatoes, roasted carrots or in salads. "The spicy pecan dust is one of my favorite items and I sprinkle it on pork (tenderloin usually) and saute the meat quickly in a pan. Best with roasted Brussel sprouts and little potatoes!!"